Currently I am registering at the Australian Medical Council (AMC) to be able to apply for the EM training in Australia. Two of our Dutch colleagues already are FACEM, they enrolled in the training program about 10 years ago. The rules have changed quite a lot since then, and nowadays it is not easy to become eligible anymore. Many others have worked or are currently working in Australia for 1-2 years, with a limited registration. That registration does not allow you to apply at the ACEM (for training). Because of the recent changes and because I could not find a colleague who did the same, I decided to share my experiences with you. For colleagues who wish to do the same. I will write different posts about the application process. If you have questions, do not hesitate to contact me using the contact form. If you have different experiences or you want to share yours on this website, please feel free to contact me also. My situation is about becoming an registrar in training, from my current position as SEHarts KNMG. I do not have knowledge about other pathways, for example te be eligible for the limited registration. I would welcome colleagues who want to share that information. 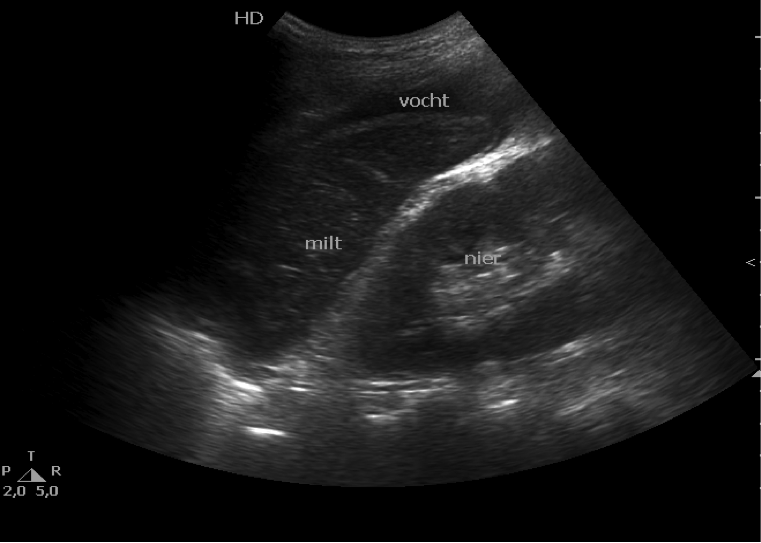 In the Netherlands, the majority of Emergency Physicians unfortunately do not use ultrasound frequently at this moment. One of the arguments I often hear is: “I don’t have the time to perform ultrasound at my busy Emergency Department (ED), because there are to many patients to take care of”. Hopefully my case will prove otherwise. A few months ago, this 40 year old guy from Poland came to our ED. Our secretary called the triage nurse to inform ‘this man doesn’t look good’, maybe you can pick him up. As the nurse went to call for this patient, he indeed didn’t look well and that was not because the use of alcohol. He looked pale and diaphoretic all over, but didn’t speak a word English, German or Dutch. As they walked to a empty room, the nurse shouted for my help as they always do. While I was doing nothing except drinking coffee at my busy ED, she said: Please come over immediately ‘this man doesn’t look good’. I carefully watched the nurse (and the patient as well) and followed them into the room with my ultrasoundmachine, because this man was indeed looking awful. As she put the man on the monitor to get his vital signs, it was my time to shout. I ordered for ECG and regular bloodtest, because he might have STEMI. While I was preparing my device I noticed the man holds his both hands on his belly. Instead of performing an cardiac exam first, I choose to do abdomen (see fig 1 and 2). I diagnosed free fluid in his belly before the needle (for bloodtest) was actually in this specific patient. Later on, we found out that he was using brufen for a week because of backpain and the CT-scan revealed an hole in his stomach, so he went for surgery and did well afterwards. I’ll guarantee, everything I just wrote down was for real (except the nurse was checking me out obviously). 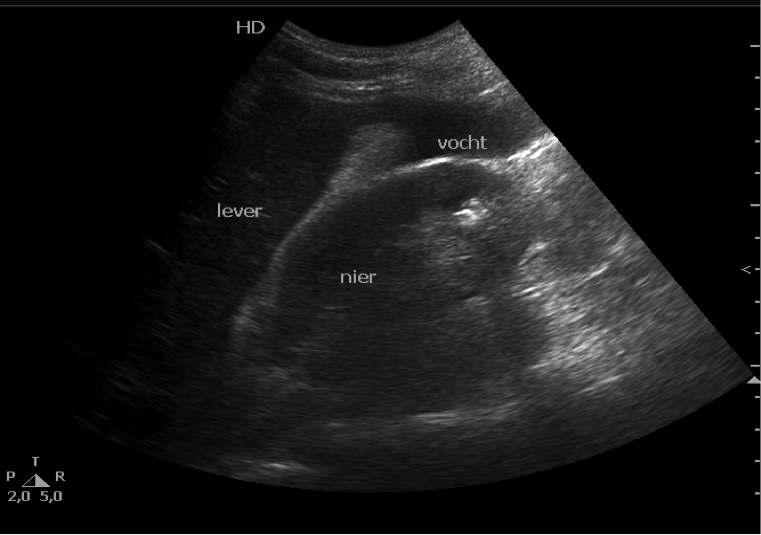 I hope this case will stimulate you all to perform ultrasound more rapid and more often in future! Those of you, interested in learning ultrasound, you can always contact me for a four week ultrasound rotation at Sint Franciscus Gasthuis in Rotterdam. Although we are fullly booked until april 2015. Today 3 incredible talks about hyponatriemia. Everything you need to know in the ED! These talks are the top 3 talks about hyponatriemia from the MNSHA Masterclass: Acute Medical Emergencies. They are in the PechaKucha style, which means 20x20sec talks….so about 6 1/2 minutes. Nr. 1 is from Klaartje Caminada. She shows the real art of PechaKucha! Nr 2. is from Jasper Rebel, who makes hyponatriemia really, really easy….in 10 steps. Nr 3. is from Heleen van der Peijl. She explains hyponatriemia step by step. Hope you will enjoy the talks….and hyponatriemia! Attached the local guideline anaphylactic reactions in Dutch from Elisabeth hospital, Tilburg, with thanks to Pieter van Driel. A while ago some of us had an email discussion about treatment, especially the role of epinephrine, and when to administer it. Would you mind sharing your local protocols with us on this website? Please contact us by mail, see homepage.